* Annual estimated passenger usage based on sales of tickets in stated financial year(s) which end or originate at James Cook from Office of Rail and Road statistics. Methodology may vary year on year. James Cook railway station (also referred to as James Cook University Hospital railway station) is a station that serves the James Cook University Hospital in Middlesbrough, North Yorkshire, England. It also serves the surrounding areas of Park End, Berwick Hills and the nearby Middlesbrough Sports Village. It is located on the Esk Valley Line approximately 2.5 miles (4 km) south east of Middlesbrough railway station and is operated by Northern who provide all of the station's passenger services. Plans for the building of a station at the hospital had been discussed for some 25 years, including as part of the Tees Valley Metro project. The station was finally given the green light by Middlesbrough Council's planning committee in January 2013 and construction work started in January 2014. The station cost £2.2 million to build and opened to the public on 18 May 2014. The station was officially opened on 18 July 2014 by the then Minister of State for Transport, Baroness Kramer. ^ "National Rail Enquiries : James Cook (JCH)". National Rail Enquiries. Retrieved 18 August 2014. ^ "Welcome to: Middlesbrough Sports Village". everyone ACTIVE: Middlesbrough Sports Village Website. Retrieved 30 June 2017. ^ "Community Consultation – Proposed Rail Halt at James Cook University Hospital". Retrieved 8 February 2014. ^ "Work begins on new £2.2m rail station at the back of James Cook University Hospital". Middlesbrough Evening Gazette Live. Retrieved 7 February 2014. ^ "Middlesbrough James Cook Hospital railway station opens". BBC Tees News. Retrieved 18 May 2014. ^ "James Cook Hospital railway station opened by transport minister". Middlesbrough Evening Gazette Live. Retrieved 18 July 2014. ^ "Estimates of station usage". Office of Rail and Road Website. Retrieved 2 December 2017. ^ "Esk Valley Railway : Northern Rail Timetable". Esk Valley Railway Development Company. Retrieved 18 May 2014. Heworth Interchange serves the Heworth area of Gateshead, England. There is a station here on the Yellow and the Green Lines of the Tyne and Wear Metro as well as one on the Carlisle to Middlesbrough rail line operated by Northern. Middlesbrough railway station serves the large town of Middlesbrough in North Yorkshire, England and is managed by TransPennine Express. Redcar East railway station serves the town of Redcar in the borough of Redcar and Cleveland and the ceremonial county of North Yorkshire, England. It is located on the Tees Valley Line and operated by Northern who provide all passenger train services. It is unmanned, so passengers wishing to travel must buy tickets before boarding or on the train. Stockton railway station serves the town of Stockton-on-Tees, within the borough of Stockton-on-Tees and the ceremonial county of County Durham, England. The railway station is located on the Durham Coast Line and is operated by Northern who provide all of the station's passenger services. Thornaby railway station, across the River Tees from Stockton-on-Tees provides a wider range of services and acts as the main railway station for most of Stockton-on-Tees. The station originally had a roof but it was removed in 1979 due to being in a bad state of repair and it has not been replaced since. The other main buildings are also no longer in rail use, having been converted into apartments. Billingham railway station serves the town of Billingham, within the borough of Stockton-on-Tees and the ceremonial county of County Durham, England. The railway station is located on the Durham Coast Line 10 miles (16 km) north of Middlesbrough and is operated by Northern who provide all of the station's passenger services. Battersby railway station serves the village of Battersby in North Yorkshire, England. It is located on the Esk Valley Line 11 miles (18 km) south of Middlesbrough and is operated by Northern which provides all of the station's passenger services. Glaisdale railway station serves the village of Glaisdale in North Yorkshire, England. It is located on the Esk Valley Line and is operated by Northern who provide most of the station's passenger services. The NYMR use this station on gala days, when they run trains along the line as far as Battersby. The station dates from October 1865, when the Castleton to Grosmont line was opened. The signal box was moved northwards in June 1902 to allow the platform to be extended towards the west;engineers simply raised the box onto rails and slid the box into its new position. Grosmont railway station serves the village of Grosmont in the North York Moors, North Yorkshire, England. It is located on the Esk Valley Line which serves one platform and is operated by Northern who provide the station's passenger services. Ruswarp railway station serves the village of Ruswarp in North Yorkshire, England. It is located on the Esk Valley Line and is operated by Northern who provide all of the station's passenger services. 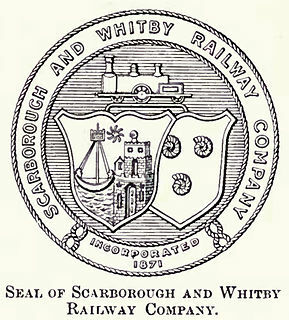 The station is 33.5 miles (53.9 km) from Middlesbrough and 1.5 miles (2.4 km) from Whitby. It opened in 1847. Whitby railway station is a Grade II listed station which serves the town of Whitby in North Yorkshire, England. It is the terminus of the Esk Valley Line, connecting with the North Yorkshire Moors Railway at Grosmont, and provides mainline running for NYMR trains during the summer months. The station is situated 35 miles (56 km) south east of Middlesbrough railway station and is operated by Northern, which provides all of the station's National Rail passenger services.